Even the most brilliant minds need to go back to the drawing board once in a while. I’m pretty sure PETA wasn’t amused. 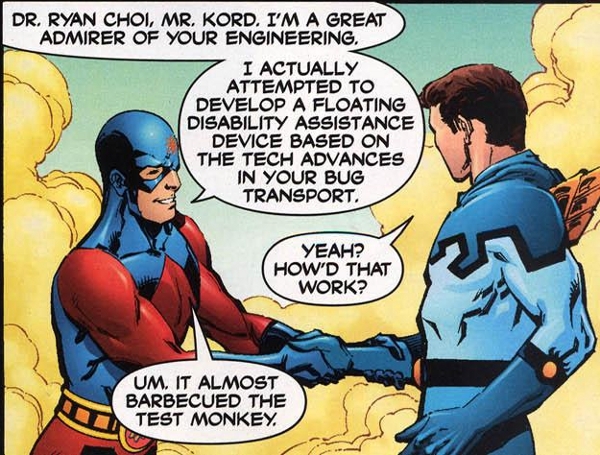 Today’s engineering failure courtesy of The All New Atom #14 (October 2007) by Gail Simone, Mike Norton, and Trevor Scott. I’m not sure what they put in the drinking water down in Ivy Town University, but, after seeing what kind of company turned up at Ryan Choi’s welcome back party, I kind of wish that they’d make it a mandatory additive. Is that a sliderule in your pocket or are you just happy to see me? This geek fantasy has been brought to you by The All New Atom #12 (August 2007) by Gail Simone, Mike Norton, and Dan Green.